The New England Patriots kept a grip on the AFC No. 1 seed with a decisive 37-16 victory over the visiting Buffalo Bills in Week 16. Patriots QB Tom Brady paced New England with 224 passing yards and two touchdown tosses as the Patriots have now won 12 games for a record eighth-straight season. Brady kept his push for records alive as well, becoming only the second quarterback with at least 12 wins as a starting quarterback at or above the age of 40, as he trails only the great Brett Favre who had 13 victories over 40. Patriots RB Dion Lewis had a great day in the victory as well, churning out 129 yards on the ground, 24 yards through the air and two combined scores. With that, we give you our PFF-exclusive takeaways from the contest for each team. 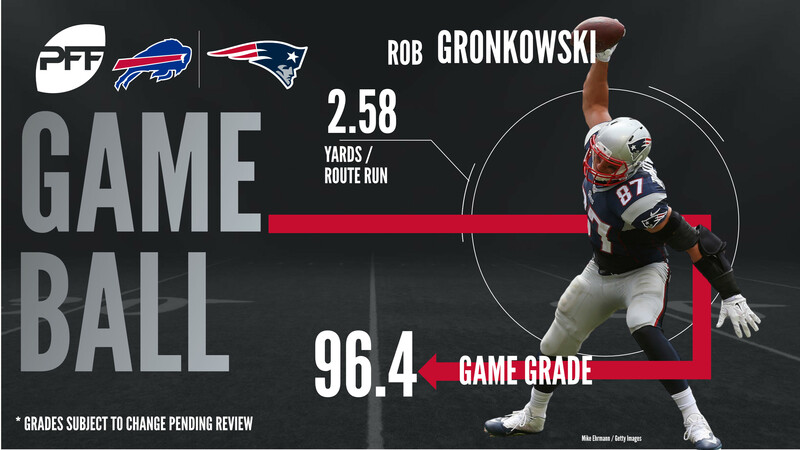 Gronkowksi made a big impact with key grabs and securing the edge on a number of outside zone running plays that paved the way for Lewis’ big game. He was a threat up the seams and in between the numbers hauling in five of his eight targets for 67 yards and a touchdown. His biggest play of the game came on an incredible one-handed grab on a back shoulder throw that went for a 17-yard score. Lewis was productive on the ground throughout the game as the the Patriots offensive line wore down the Bills defense in the second half. He finished the game with 129 yards on 24 carries and a touchdown, finding success both on the edges and up the middle on man-blocking schemes. He racked up 68 yards after contact against Buffalo. Despite not getting in on one of the six sacks on Taylor, Flowers was disruptive in both the run game and a pass-rusher racking up five defensive stops, including four in the run game for a run stop percentage of 18.2. Flowers tacked on a QB hit and two hurries while beating the offensive lineman an additional three times but the pass was out too quickly to generate pressure. The third-year product of Arkansas has been an excellent pick for Bill Belichick in the fourth-round as he has increased his pressure numbers substantially this season. Chung led all defenders in targets into his coverage area with nine, and topped all defenders in game grade. Chung allowed just three of those passes to be caught for 27 yards and breaking up three of them. Most of his damage was against Charles Clay as Taylor targeted the tight end five times against Chung, who allowed just one reception for 11 yards while notching two of his pass defenses. The veteran from Oregon is having one of the best seasons of his career in coverage and his improvement was on display against Buffalo. Taylor’s final statline looks as if he was fairly inaccurate on the day but he was the culprit of three drops by his receivers and had two throwaways resulting in a respectable 66.7 adjusted completion percentage. Struggling to throw to the intermediate range, Taylor completed just 3-of-9 for 67 yards on passes targeted 10-19 yards downfield. Under pressure, Taylor often took his eyes off the secondary and to the rush resulting in his six sacks, including four by his own accord. He did average 9.3 yards per attempt when under duress but his mishaps taking those sacks for a negative of 39 yards resulted in just 6.7 net yards per attempt under pressure. The Pro Bowl running back turned in another excellent game as he used his elite vision and acceleration to find running lanes and make defenders miss in space in the passing game. Outside of just one drop on a swing pass, McCoy was virtually flawless in his execution highlighted by an impressive 39-yard catch and run on a scramble, making three defender miss. McCoy averaged 2.71 yards per route run and Taylor had a passer rating of 106.8 when targeting the star running back. Poyer was the Bills top defender for the game, playing solid against the run and making a key play in the passing game. Poyer jumped a crossing route with Kenny Britt drifting upfield, allowing him to step in front for the interception and weaving his way to the endzone for a touchdown. He gave up a couple grabs to Rob Gronkowski where he was tight in coverage but beaten by a good throw and catch. In total, Poyer was targeted four times giving up three catches for 32 yards and the pick. Johnson stuggled throughout the game both on the edge in run support and in coverage. Against the pass, Johnson gave up five catches on five targets for 61 yards. He gave up 41 of those yards after the catch, struggling to rally to the ball and make tackles. In total, he missed three tackles in the game.